Potted bulbs planted in October have burst into bloom this week. The scent is just wonderful! Delph Blue hyacinths, tete-a-tete mini daffodils white Carnegie Hyacinths, and creamy white Jacob hellebore. On the other side of the table, out of sight, is my seed sowing station. It’s lovely to be enveloped in spring scents. Much nicer than (the usual) lawnmower engine oil and compost! Have your spring flowers burst into bloom yet, or are you still waiting for that wonderful moment? 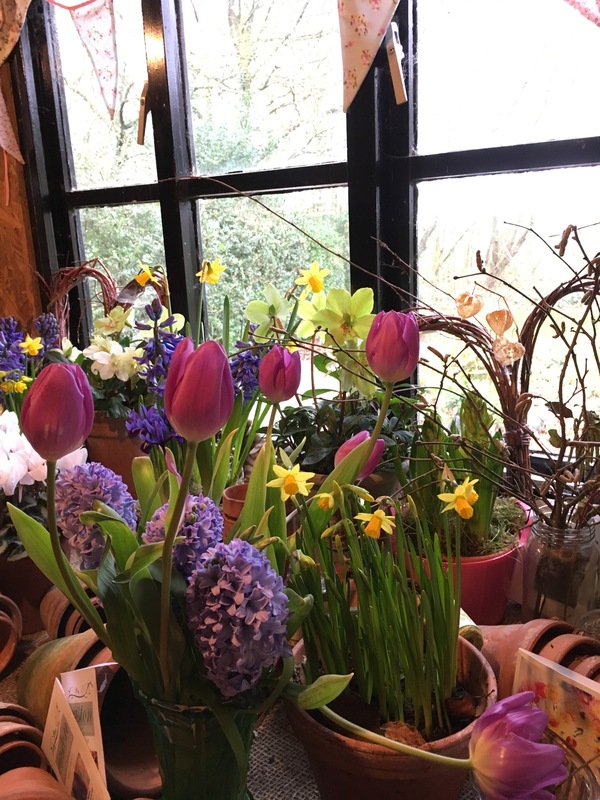 ← Out of my pottingshed- again …..
A super display. I can smell them from here, I’m sure! What a beautiful Spring photo… Love it! Your potting shed is so lovely, had to laugh at the engine oil. – today Iris reticulata (grown outside) made an appearance here too, just hoping they are still ok after tomorrow’s forecast winds. So beautiful!We are still waiting! Magic. If only I could be so organised! Next year..
❤ this photo of your bit of heaven, Karen! I'm still waiting for our spring – soon to come! A truly beautiful photo! I love the beauty of Spring flowers after a long gloomy winter. Completely uplifting. Now I am thinking I should go buy some of my own 🙂 Thanks for sharing! Glorious picture – but how have you got tulips flowering already Karen? There was a lot of faffing about putting bulbs into the bottom of the fridge to make them think they had had a winter, then potting them up and putting them in the heated greenhouse. I’ve got them about four weeks earlier than in the garden. It was a lot of effort for two pots of tulips. Christina from Hesperides garden wrote about it last year and I copied her idea.